The Arisun Mount Cameron 26x2.10 All Mountain MTB Tyre is our recreational All Mountain bicycle sports tyre. We believe this tyre really has the X factor as the large spaced tread blocks provide excellent traction and hence great acceleration, plus they allow you to shed dirt and debris as you ride. The angled corner tread gives great grip when cornering. 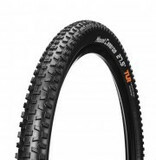 This tyre works well in medium and loose pack dirt and mud. Some riders see this as the ideal choice of rear tyre. This 26x2.10 bike tyre is wire beaded and therefore not foldable.